Stream Group enables operators, broadcasters and media companies to quickly launch extensive, interactive TV and video platforms. We offer both end-to-end turnkey and highly customized solutions, including a wide-ranging experience for all content types including live, VOD and catch-up. Start today with the next generation of video experience! Stream Group has over 10 years’ experience in providing solutions for OTT, IPTV and Hybrid DVB projects. Stream Group offers operators and broadcasters a solution for the next generation of video distribution and streaming. Designed to give broadcasters and operators a complete solution for any video related challenge with a rapid time to market. Relevant building blocks for any tailor made solution to meet our customers’ highest demands. Establish an open and modular platform with no vendor lock-in. Stream Group’s platform includes a comprehensive set of tools to maintain control over marketing, operations and customer experience. Enable your customers to consume their favourite TV content anywhere, on any device, at any time. An integrated solution for media storage, processing and delivery applications such as network PVR and VOD expansion. Support for several VOD business models which enables implementation of various monetization models like T-VOD, S-VOD, A-VOD and even push VOD. Our hosted DRM solution provides support for multiple business models and is optimized for the new generation of connected devices. Video contribution and distribution, with access to our Pan European IP video backbone for permanent use by TV operators or media companies. Reduce the time to market with our turn-key end-to-end solution and launch within only a couple of weeks of time. Significant reduction of investments and operating costs with increased flexibility to boost your business case and return on investment. Our global team of video experts has fulfilled and delivered more than 30 successful OTT and IPTV projects over the years. Stream Group integrates the best third party solutions in its platform to let you benefit from the latest advancements and stay ahead as technology evolves. 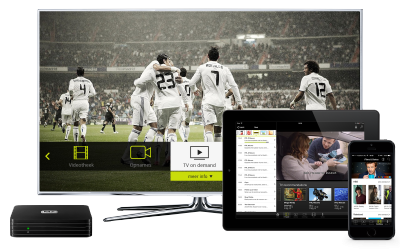 Dutch ISP Online.nl selected Stream Group to develop a new service created to offer Live TV, Multiscreen, OTT and VOD services to online viewers on xDSL and FttH networks throughout the Netherlands. 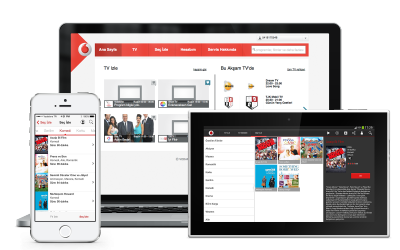 Stream Group launched a comprehensive OTT Multiscreen service for Vodafone Turkey’s mobile subscribers. With a base of more than 19.3 million mobile customers in Turkey, Vodafone delivers OTT video services to a tremendous amount of mobile devices. Feel free to contact us if you have any further questions, or make an appointment for a product demonstration. Never miss important updates and insights about interactive television.